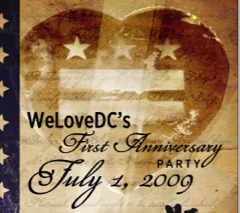 Reminder: We Love DC Party Tomorrow! That’s right, we’re just 24 hours away from our first anniversary party at Science Club! We’ll be starting up around 7pm with drink specials ($3 Yuenglings, $4 Guinness and Amstel Light! $5 Santa Rita Carmenere and Veramonte Sauvignon Blanc! Rail drinks $4!) as well as Don’s awesome photobooth on the 3rd floor. We’ll be collecting $5 contributions for Bread for the City at the door, as well, so come give back to your community, and hang out with everyone to help celebrate our first anniversary. What a great way to start the Holiday weekend!